That’s a pretty powerful concept. But in a competitive environment you can’t just keep raising prices. At some point customers will stop buying. The key is to find the balance point where you maximize profitability. Pricing Gurus helps companies take a scientific approach to determine what prices to charge. We have been in scenarios where price was determined by increases in product cost, begging of the sales team and the whim of the CEO. These are inefficient processes that risk company revenues and drive your customers crazy. There are better ways to do this. We don’t try to boil the ocean! 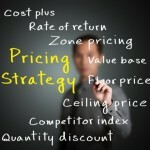 Pricing Gurus focuses on providing small and medium sized companies with affordable practical pricing guidance. Our experience comes from working with companies such as Microsoft, Intel, Honeywell, IBM and HP. Combining that experience with a deep understanding of the business world and marketing savvy helps provide actionable advice for your individual situation. We help companies during the front-end of the product development process which is the right time to think about price. We also dive in at the back end when things start running amok. Learn more about us. Pricing Gurus uses scientific research to take the guesswork out of the pricing process. We work with you to define key market and product assumptions. For example – what specific features do your customers value? What are they willing to pay for them? And conversely – what are they not willing to pay for. We then go and gather solid customer and market research to support or negate these assumptions. Using a holistic marketing approach, we help determine the best set of strategies to implement. Equally important is developing and rolling out strategies to communicate new price and value propositions. This helps ensure customers feel they are getting their money’s worth. Examining sales channel efficiencies to look for improvements rounds out the overall process. Learn more about the pricing process we use. When More is More: taking advantage of purchaser (mis)understanding of discounts. Should you offer a discount to kick start sales of a new product? Or to revive sales of a forgotten product or service? Pricing Gurus recommends you hold the line and treat discounts as temporary, lest you simply lower the prices. Practitioner’s guide for those conducting their own pricing research, focusing on the Van Westendorp Price Sensitivity Meter.